Delta Air Lines is not immune from soft domestic pricing. Will domestic capacity shrink? Can it? Delta Air Lines’ 2Q2015 overall favourable financial performance was overshadowed by its decline in passenger unit revenues, which now do not seem destined to return to a positive performance in 2015. The airline anticipates that its unit revenues will remain flat by YE2015 after falling during 3Q2015, which is during the high season for US travel. Delta has identified three markets where it is experiencing the largest decline in yields – Dallas, Chicago and Orlando. American and Southwest appear to be engaging in competitive pricing action in Dallas and Chicago, and ULCCs have also added service in some of those markets during the past year, creating challenges in achieving yield traction. The airline’s projected fall in 3Q2015 passenger unit revenues, and estimates of a flat performance at YE2015 are a bellwether for US domestic pricing trends for the remainder of 2015. With a couple of exceptions, it seems as if most of the country’s airlines will record an unfavourable unit revenue performances for 2015, which is not sustainable over the long term. Delta recorded unit revenue and yield declines in all of it geographical entities during 2Q2015, with the declines in the domestic market the least severe. Domestic unit revenues and yields each fell 1% on a six percent capacity increase. Although Delta estimates that 2.5ppt of its 4.6% passenger unit revenue decline during 2Q2015 was attributable to currency fluctuations and lower fuel surcharges in its international markets, lower domestic yields contributed to the remainder of the decline, roughly 2.1ppt. Company CEO Richard Anderson observed that domestic yields have “been under pretty significant pressure”. Delta has a higher exposure to the domestic market than its full service, global network rivals. 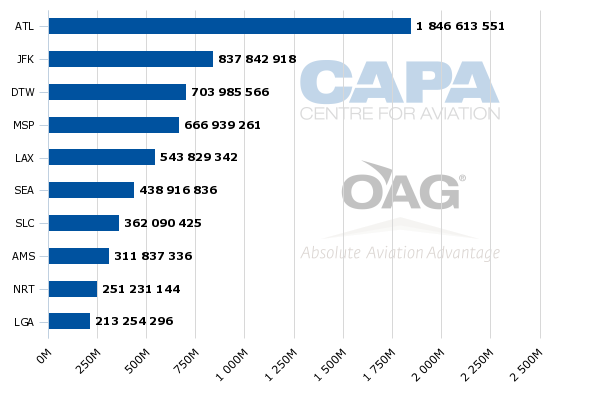 For the week of 20-Jul-2015 to 26-Jul-2015 roughly 83% of its seats and 53% of its ASMs are deployed onto the less competitive domestic routes. 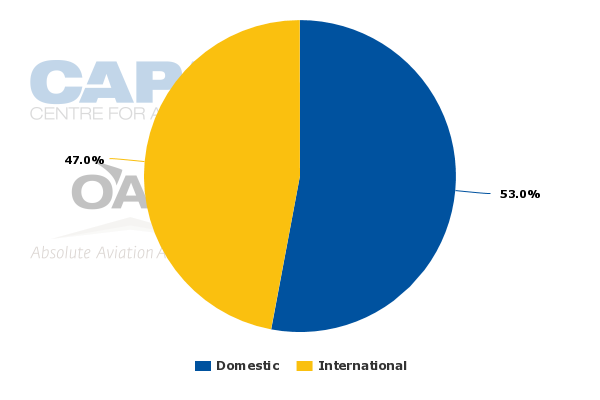 In comparison, United has 76% of its seats and 51% of its ASMs deployed in domestic markets. 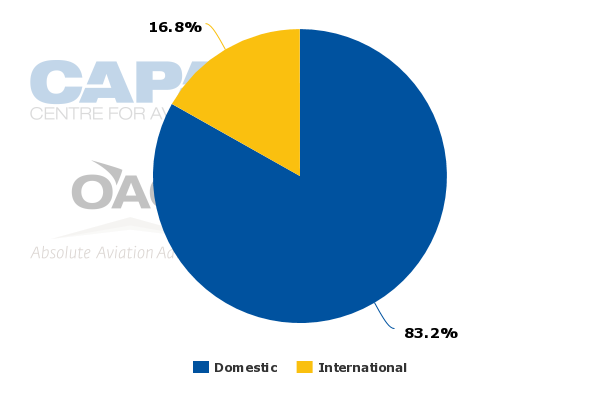 For American, 76% of its seats and 55% of its ASMs are dedicated to the domestic market. 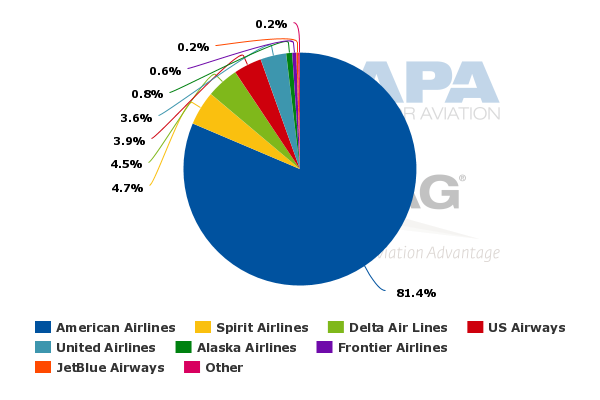 US Airways, which is merging with American, has 89% of its seats and 73% of its ASMs allotted to the domestic space. On a month-by-month basis in 2Q2015 Delta’s domestic unit revenues were flat in Apr-2015, and down 3% in both May-2015 and Jun-2015. The airline expects 3Q2015 unit revenues to fall 4.5% to 6.5%, and company CEO Ed Bastian cited choppiness on a month-to-month basis. He projected that the airline’s performance should be better in Jul-2015 and Sep-2015 than Aug-2015. July and August are typically the high season for US travel before the shoulder season settles in during September. But even as demand appears to remain steady in the domestic market, Mr Bastian stated that it was Delta’s expectation that its overall revenue guidance reflects the expectation that “through the summer that domestic weakness is going to remain”. Delta is planning system capacity growth of 3% for 3Q2015, and flat capacity growth for 4Q2015. Its international capacity during 4Q2015 is falling 3.5% and domestic growth is projected at 2%. “We believe this plan is in line with current demand in GDP forecast, and it will allow us to get our unit revenue back on the right trajectory with our goal to be flat by the end of the year,” declared Mr Bastian. That is a different sentiment than a previous declaration made by Delta’s president that the airline should “get our unit revenues back on a positive trajectory by the end of this current year”. See related report: US airline 2Q2015 unit revenues sink as capacity continue to creep up. The cycle returns? Even as the domestic yield environment remains weak, Mr Bastian highlighted that Delta posted margin expansion in all of its hubs during 2Q2015, and that roughly three markets represent approximately 50% of the overall domestic yield weakness. Those markets are Dallas, Chicago and Orlando. None of those markets are hubs for Delta, or rank among its top 10 bases measured by seats and ASMs, but Delta operates to many of its hubs from those three markets, and has seen heightened competition on some of those routes during the last year. Delta represents just 4.5% of Dallas/Fort Worth’s (a large hub for American) domestic seats and 4.7% of its domestic ASMs (based on data from CAPA and OAG for the week of 20-Jul-2015 to 26-Jul-2015). Pricing in the Dallas market fell after Southwest began adding numerous new routes from Dallas Love Field once the Wright Amendment that limited certain longer haul flights from the airport was repealed. American overall has matched Southwest’s pricing, and in some cases, the prices of ULCC competitors. 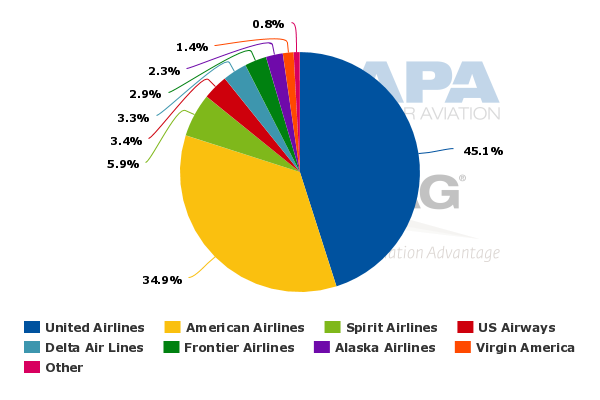 Spirit is DFW’s second largest airline measured by seats and ASMs. From DFW, Delta operates flights to its hubs in Atlanta, Cincinnati, Minneapolis, Detroit, Salt Lake City, and New York LaGuardia and JFK. It also operates service to Los Angeles. 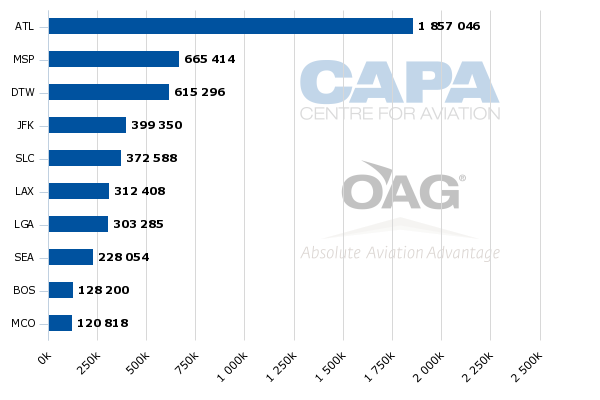 Data from CAPA and OAG show that for the week of 20-Jul-2015 one-way seats have increased from DFW to Cincinnati, Minneapolis, Salt Lake City and New York JFK. Seats have jumped 40% in Cincinnati after Frontier added flights during the last year and American increased its seats by 14%. American holds a 51% share of the 4,306 total seats. Delta represents a 27% share and Frontier has a 22% share. Seats have grown 3% in Minneapolis, with American increasing its seats 2% and Delta posting a 7% rise. American represents a 47% share of the approximately 12,605 one-way weekly seats followed by Delta and 32%. Spirit and Sun Country each represent a 10% share and have kept their seats flat year-on-year. American and Delta compete on flights from DFW to Salt Lake City, where seats have grown 20% year-on-year to 10,280. American, which holds a 60% seat share, has grown its seats 25% year-on-year and Delta has posted a 10% rise, holding a 40% seat share. Seats from DFW to JFK are up 4% to roughly 2,737. Delta’s seats are flat and American’s have grown 5%. American and Delta’s seat shares are 80% and 20%, respectively. Seats are down 7% in Los Angeles to 24,873, with Delta holding a 8% share, American holds a 79% share, Spirit has a 9% share and United retains a 4% share. On the DFW-Detroit pairing, seats are roughly flat year-on-year at approximately 10,458. American and Delta, which hold 55% and 35% seat share, have decreased their seats on offer by 1% and Spirit, which holds a 10% share, has flat seat counts. In Atlanta, seats have fallen 10% to roughly 20,729. Spirit’s are down 50%, American has posted an 8% decline and Delta a 5% drop. Delta has a 56% share, American a 39% share and Spirit a 5% share. Southwest and Delta operate flights from Love Field to Atlanta, and Southwest and Virgin America offer service from Love to Los Angeles and New York LaGuardia. Later in the year Southwest is set to start flights from Love to Detroit and Salt Lake City, which creates additional seats in those markets, and increases competition with American and Delta. Although at the moment there is not a huge overlap for Delta with Southwest in the Dallas market, overall pricing dynamics in Dallas have shifted, and Delta in some cases has little choice but to adapt to that shift given its competitive overlap with American. Spirit and Frontier are also contributing to the discounting. Similar to DFW, Delta has a small presence at Chicago O’Hare, a hub for both American and United. Delta represents roughly 5% of O’Hare’s domestic seats on offer and 3% of it ASMs. Recently, United cited pricing pressure in Chicago, where American was matching Southwest’s fares at Midway, which will have a knock-on effect on other airlines serving those markets. Delta operates flights from O’Hare to its hubs in Atlanta, New York (JFK and LaGuardia), Cincinnati, Minneapolis, Detroit, and Salt Lake City. It also operates service from Midway to Atlanta, Detroit, Minneapolis and Salt Lake City, competing with Southwest on those pairings. It also competes with American on all its flights from O’Hare and with United on flights from O’Hare to Atlanta, LaGuardia, Cincinnati, Minneapolis, and Salt Lake City. Spirit and Frontier operate flights from O’Hare to Atlanta, and Spirit operates service to LaGuardia while Frontier offers service from O’Hare to Salt Lake City. Seats have increased year-on-year in every market Delta serves from O’Hare with the exception of LaGuardia, where seats have fallen 1%. 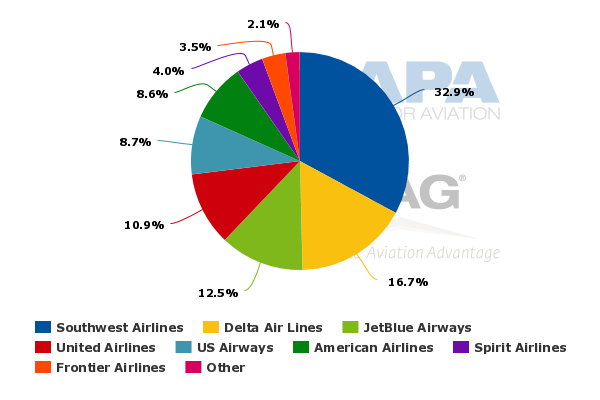 Delta holds a commanding 54% share of the 20,322 one-way seats on offer from O’Hare to Atlanta, followed by American at 20%, United at 16% and Spirit and Frontier each at 5%. Seats from O’Hare to JFK are up 9% to 8,596. Delta has grown its seats 18% and JetBlue has increased its seats by 8%. American has kept its seat numbers flat. JetBlue has a 41% share, Delta 35% and American 24%. United has increased its seats from O’Hare to LaGuardia by 13% even as overall seats are down 1% to 36,355. American holds a 42% share, United 33%, Delta 18% and Spirit 7%. Between O’Hare and Cincinnati, seats have grown 14% year-on-year to 7,793. American has posted a 14% drop, Delta has recorded a 59% increase and United’s seats are up 18%. American holds a 30% share, Delta 31% and United 40%. Both American and Delta have increased seats from O’Hare to Minneapolis, resulting in overall seats growing 14% to 22,068. American has posted a 38% increase and holds a 25% share. Delta’s seats are up 18% and retains a 30% share. United’s have grown 3% and it has a 30% share, and Spirit’s are flat. Its share is 15%. From O’Hare to Detroit, seats have grown 7% year-on-year to 12,706. American has recorded a 6% increase and holds a 27% share, Delta’s seats are up 7% for a 45% share and United has expanded its seats 8% for a 28% share. Between O’Hare and Salt Lake City, seats are up 19% to 6,726. American’s are flat and it has a 16% share, Delta’s are down 4% and it holds a 37% share. United’s have grown 1% and its seat share is 30%. Frontier has entered the market within the last year, and it has a 17% share. 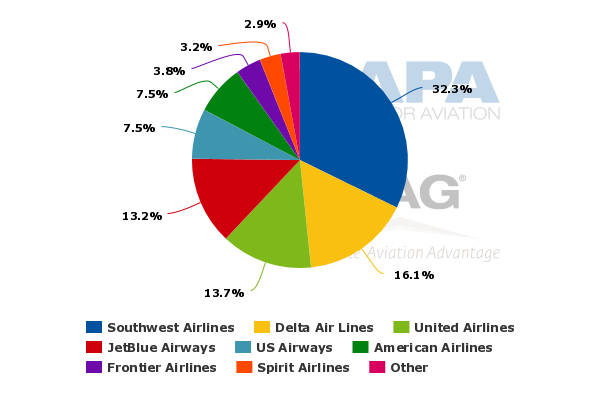 Southwest holds a commanding seat share in all the markets where it competes with Delta from Midway. In some ways both Delta and United are caught in the crosshairs in Chicago, given their competitive overlap with American, which seems to be engaged in pricing action with Southwest in the market. Delta is Orlando International’s second largest airline measured by domestic seat and ASM deployment, holding a 17% of seats and 16% share of ASMs. From Orlando it serves Atlanta, Boston, Cincinnati, Detroit, Los Angeles, Minneapolis, JFK, LaGuardia and Raleigh-Durham. Schedules in CAPA and OAG also show that it offers 77 weekly one-way seats or fewer from Orlando to Grand Rapids, Hartford, Indianapolis, Kansas City, Louisville, Milwaukee, Nashville, Pittsburgh and Memphis. Both Spirit and Frontier have launched service from Orlando to Atlanta during the last year. Spirit has a 4% share of the roughly 31,775 seats on offer and Frontier holds a 3% share. Delta retains a commanding 71% share and Southwest has a 22% share. Delta competes with JetBlue on flights to Boston from Orlando. Seats are down 6% to roughly 8,372; JetBlue has posted a 9% drop while Delta has increased its seats by 8%. JetBlue holds a 75% share and Delta has a 25% share. Frontier has launched service between Orlando and Cincinnati during the last year, and holds a 46% share of the 2,102 seats on offer. Delta has a 54% share. Delta competes with Spirit on service between Orlando and its Detroit hub. Seats are up 1% to 9,556, with Delta holding a 82% share and Spirit retaining a 17% share. Los Angeles is one of the more crowded markets from Orlando. Seats are up 18% year-on-year to 9,586. American has a 25% share, Delta a 39% share, United 25% and Virgin America 11%. Delta competes with Sun Country on flights from Orlando to Minneapolis. Delta holds an 83% share of the 6,240 seats and Sun Country has a 16% share. JFK and LaGuardia are among Orlando’s busiest routes by seat deployment, representing the second and sixth largest, respectively. Seats between Orlando and JFK are up 8% year-on-year to 18,626. American holds a 13% share, JetBlue a 59% share and Delta a 28% share. Between Orlando and LaGuardia, seats have risen 14% year-on-year to 12,040. Delta has a 56% share and JetBlue has a 44% share. Will there be capacity contraction in the US market during 2016 to regain pricing traction? Although the major markets undergoing yield pressure are not hubs for Delta, it is clearly feeling the effects from the lack of yield traction in Dallas, Chicago and Orlando. This also means that other airlines are also feeling the same yield pressure. Even ULCC Spirit has recently revised its 2015 operating margin guidance due in part to soft pricing in the peak summer season. Despite this Delta still projects a healthy 19% to 21% operating margin for 3Q2015 after posting a 16.8% operating margin in 2Q2015. Its 3Q2015 margin guidance is driven in part by lower fuel prices as the pressure it faced from its hedge book starts to ease in 2H2015. Delta now seems to be in the same mindset as rival American, concluding that unit revenues will not likely reach positive territory until 2016. For now lower oil prices are more than offsetting the unit revenue pressure. But Delta and its rivals recognise that negative unit revenues are not viable over the long term. At some point all US airlines may need to re-examine their domestic capacity targets in order to restore supply-demand equilibrium to regain pricing traction. For now Delta is holding steady to its domestic growth targets, but a different story may unfold in 2016.